If ever a book were to be called magisterial, this one is. At 657 pages it is a doorstop of a read and enormous in scope—no surprise coming from one of our preeminent science journalists, Carl Zimmer. 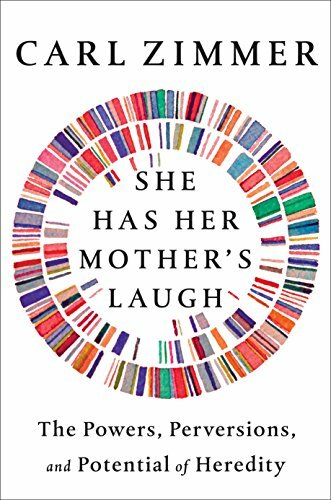 In She Has Her Mother’s Laugh: The Powers, Perversions, and Potential of Heredity, Zimmer shows how heredity is counterintuitive and full of surprises. Even someone as recent as Darwin was baffled by it, conceding that “the laws governing inheritance are quite unknown.” Not knowing them didn’t stop Darwin’s cousin, Sir Francis Galton, from publishing Hereditary Genius in 1869 and afterward promoting his false science of eugenics that led to racial laws, forced sterilization, and other disastrous ends. The “American obsession with genealogy” dates back to the 1700s when some families sought to tie their ancestry back to Europe. Thomas Jefferson tried to hunt down his British coat of arms, without success. Benjamin Franklin poured over parish registries and the “moss-covered gravestones of his ancestors” in the English village of Ecton. We are still at it judging by the news of using genealogy websites to locate once elusive murderers. The popularity of outfits such as ancestry.com and 23andme prompt Zimmer to discuss what insights sequencing one’s genome can and can’t provide. He is the first journalist to have his entire genome analyzed by cutting–edge researchers, the results of which he shares with readers. He explains why mitochondrial DNA, inherited only from mothers, makes it a powerful genealogical tool and why we can trace everyone’s mitochondrial DNA to a single African matriarch who lived 150,000 years ago. And because “Neanderthals and humans interbred many times” over 200,000 years, more Neanderthal DNA exists today than when the species was alive. Zimmer is an excellent storyteller. Absorbing tales do double duty in laying out details of basic biology, historical discoveries, and complicated research. His ease with narrative makes the book hard to put down in places, a rarity in science writing. Yet the sheer size of this tome becomes a drawback when Zimmer wades into mind-numbing detail about technical issues such as gametogenesis or restriction endonucleases. The reader can gloss over these. The author has a knack for distilling complex ideas into a phrase. “Heredity now gained a geography,” he says in recounting how the discovery of chromosomes mark how physically far apart genes are from one another. Meiosis, which involves swapping genetic material between chromosomes “lets evolution do its job better.” And “big samples are statistically more likely to reveal important patterns” explains why Mendel needed to cross 10,000 varieties of pea plants rather than a dozen. Zimmer argues that we think of heredity in obsolete terms today. The concept of race, for example, arose in the 1500s in the context of persecution. Spanish Jews were defined as a separate race from Old Christians. Other races were subsequently defined and despised while oppressors profited from slavery. Today’s science has little use for old racial categories because scientifically they make no sense. Zimmer thinks we need a new definition of heredity given recent discoveries such as CRISPR and CAS–9 gene editing. Both editing techniques allow for the synthesis of short pieces of DNA from scratch that can be inserted into a species’ genes and allow us to “override Mendel’s law.” He discusses ethical implications, but also highlights successes such as the breeding of malaria–resistant mosquitoes. Release a few genetically–modified mosquitoes, and resistance spreads throughout the entire population in a few years. What sounds great, however, could turn into a nightmare. You might use gene editing to wipe out an invasive species only to have interbreeding spread the engineered genes to an endangered species and unintentionally drive it to extinction.